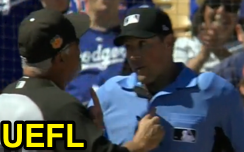 HP Umpire Quinn Wolcott ejected White Sox Manager Rick Renteria for arguing balls and strikes in the middle of the 3rd inning of the Dodgers-White Sox game. After striking out Dodgers batter Trayce Thompson to end the top of the 3rd inning, White Sox pitcher Carson Fulmer engaged Wolcott in a dispute about the strike zone, upon which Renteria was ejected in pursuit of the conflict, the call was irrecusable. At the time of the ejection, the Dodgers were leading, 2-0. The Dodgers ultimately won the contest, 13-7. This is Quinn Wolcott (81)'s first ejection of Spring Training, the 2017 MLB preseason. Quinn Wolcott now has 0 points in the UEFL Standings (0 Previous + 0 Spring Training = 0). Crew Chief Quinn Wolcott now has 0 points in Crew Division (0 Previous + 0 Spring Training = 0). This is the fourth ejection report of Spring Training 2017. This is the 1st Manager ejection of pre-season 2017. This is CWS's 1st ejection of Spring Training, T-1st in the Cactus League (CWS, LAD 1; Others 0). This is Rick Renteria's first ejection since September 26, 2014 (Jeff Nelson; QOC = Y [Balk]). This is Quinn Wolcott's first ejection since March 12, 2017 (Edgar Gonzalez; QOC = U [Balls/Strikes]). Wrap: Los Angeles Dodgers vs. Chicago White Sox (Cactus), 3/18/17 | Video via "Read More"